Christine you are a very enthusiastic, vibrant and charismatic speaker, trainer, Author, Actor and Friend. You are knowledgeable in so many fields and it is fun to spend time with you and your inspiring, life changing and innovative programs. Keep up the good work. You are a Treasure and a Gift to this world. Just a quick question: what if one gets questions reading your book … Do we have an interactive page where you and other subscribers can share our thoughts … apart from FB … Your response is highly appreciated Christine. I could do some exercises on my own relationship with time reading your book. I kinda liked uncovering myself … So would like to build on myself … Thanks much for the possibilities through the book. A good read, I must say. Thanks so much for your comment. This blog is meant to act as an interactive forum. I very much welcome your thoughts. I also periodically do teleseminars/professional Webinars. I can let you know when the next one is ~ it looks like it may be in July. Please be in touch! 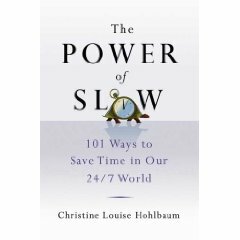 The best way to do so is to subscribe to this blog and also on Facebook at http://facebook.com/powerofslow. Thanks for stoppong by, Thomas! Glad you liked the book!